Jhene Aiko is a talented singer-songwriter who has appeared on numerous Top 40 hits over the past five years. She is best known for her feature work on hits from some of rap’s biggest stars during that time. Most notable of these are Big Sean’s “Beware” and Omarion’s “Post To Be”. Aiko has also found success on her own, with her single “The Worst” achieving platinum status from the RIAA. Her latest solo single is off her upcoming album TRIP 17, and is titled “While We’re Young”. 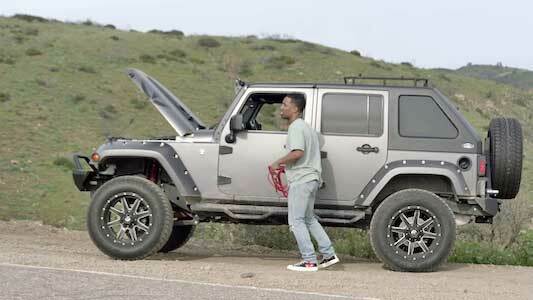 Micah tries to meet Jhene on the side of the road. The song is a slow, bass heavy pop tune that chronicles how in love a young woman is with a guy. She has decided that he is the one, and that they should run away together while they’re young. She says that she’ll go wherever he goes, even if it’s a dumb idea, and that’s how much she loves him. The beat sounds muddled with only the cracks of the snare breaking through the low tones. This mimics the dreamlike state Aiko is in, and it highlights her light vocals really well. Micah wears a pair of “Hidden Heart” chucks while he pretends to get beaten up. The video stars Aiko as a girl with short term memory loss. She goes to a diner every morning to eat waffles and draw, but one day she meets a young man named Micah who quickly steals her heart. We see home movie footage of their budding romance, but when she wakes up next to him in bed on their 66th day together, she doesn’t remember who he is. This happens a few times, with Micah eventually being banned from the diner because he was scaring Jhene. This leads Micah to start creating situations to meet her for the first time again. He waits for her on the side of the road so she’ll help him jump start his car, and pretends to get beat up by a friend so she’ll come to his aid. Eventually, he is able to get through to her, and show her through the home movies that they’ve actually been together for a while now. He tells her that he loves her, and the video ends with them about to kiss. In the video, Micah is seen wearing a pair of the “Hidden Heart” high top chucks, a shoe collaboration between Comme des Garçons PLAY and Converse. The video does a great job establishing the heartbreak that can come when someone has condition like this, and how true love can rise above it. Find your true love in a new pair of chucks by clicking on the links below.